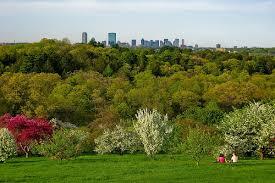 After a long drab winter, there is no better place to enjoy the bursting colors of spring than Harvard’s Arnold Arboretum in Jamaica Plain, Boston. Great for a day trip or a weekend exploration, the Arnold Arboretum is the most colorful gem in Boston’s Emerald Necklace. Boston is surrounded by a fabulous network of parks and public green spaces that bring communities together and provide opportunities for residents and visitors to explore natural spaces surrounding the city. For horticulturalists, from professional to amateur enthusiasts, there is no space more inspiring than the Arnold Arboretum. An arboretum is a place where trees, shrubs, and herbaceous plants are cultivated for scientific and educational purposes. The Arnold Arboretum was fist established in 1872, when the whaling merchant, James Arnold, transferred a portion of his estate to Harvard university “for the establishment of an arboretum, which shall contain, as far as practicable, all the trees [and] shrubs . . . either indigenous or exotic, which can be raised in the open air.” Since then, this amazing public space has acquired over 15,000 plants and each “has a story to tell, and is preserved as both scientific and horticultural specimens to enrich our understanding of biodiversity” Each plant is labeled and arranged throughout the property in collections. 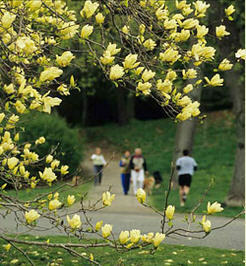 The collections include lilacs, magnolias, beeches, lindens, crabapples, roses, peonies and many more. One of the most popular collections is the Explorer’s Garden. It contains the most outstanding specimens of tree peonies, giant stewardia, a hundred year old Chinese fringe tree and a grove of dawn redwood. At any time of year, I love to wander around the arboretum, discovering trees and shrubs that are new to me or re-discovering old favorites. 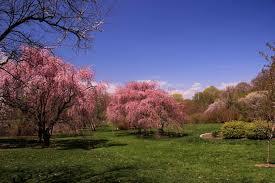 But the best time is in the spring, when the Arnold Arboretum is bursting with flowering Magnolias, lilacs, dogwood, apples, and many other species. Breathing in the fresh air, filled with the fragrance of spring blooms is an invigorating way to start the season and find inspiration for this year’s coming projects.